Love to go to matinees, especially when the expectation is high. Good film, good stories, attractive images, fantasy flies high, resulting in a few hours of daydreaming. That is time well spent. 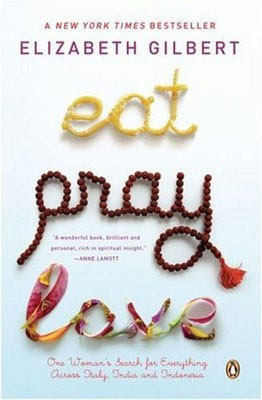 I cannot say all of this about the film I saw last Sunday Eat Pray Love, a two hours and half wasted in the cinema. As an Italian born, I am totally offended about the view of Italy that Hollywood portraits. Take a look of that scene in Rome when Liz Gilbert (Julia Roberts) is looking for a place to stay for a few months. She enters a dilapidated building, with no hot running water. The owner of the house tells her to boil the water three to four times to fill up the bathtub. Liz responds the water will not be enough for a bath and the Italian woman rebuttals that she will have enough to wash the most important parts. What an absurdity! There is no house in Italy, old or new that doesn’t have hot running water. Italians don’t live in dilapidated homes, nor they rent them to travelers. We might be surrounded by antiquity, we open our windows and often see the beauty of history all around us, but Italian home interiors are very modern with sleek lines, chic décor, valuable furnishing and most of the time very avant-guard style. Where has Hollywood gone on vacation and experienced no hot water bath? Another stereotype is the scene of a boisterous group of young lads going after the women tourist pinching their bottoms and vocalizing their pleasure. Italian men might have done that in the 18-1900s when education was a privilege of the élite, but that custom no longer exists in the civilized Italy. Italy is a very modern and vibrant country. We have everything the world wants from style and beauty to good manners and to the art of knowing how to live well, but we also have all the problems of every modern industrialized country. Italians have a high level of education, men don’t have time to spend their days pinching ladies’ derriere, they are too busy keeping up with the tough demands of the European Union as much as Italians in general don’t loose their days eating spaghetti and pizza all the day long. It is an archaic myth, Hollywood! In the film Julia Roberts is in search of herself and her purpose. For one year she takes a yuppie vacation around the world, her hair is well highlighted for the entire trip and she is somewhat well dressed. That is not what people do when they are lost in life and want to find a new direction. I believe when people are questioning their life is because they want to find a deeper meaning and discover their soul again, certain futile aspects of their life might and will pass in second order, but not in this film. Ok, I forgot, this is Hollywood and I want to be critical. All in all the scenery is OK, Hollywood could have done better with the means it has, it feels more like a travel log than a film with a spiritual meaning. It teaches us that anytime there is an obstacle in a marriage, it is better to break it up and go on a world trip, instead of understanding each other and work it out. Good teaching for the young generation……! The film is very shallow, I totally agree with you. When we are lost in life, there is no travel that will help us, unless we turn to our Supreme giudance whichever it might be. We forget that Supreme presence is with us every day. I am in total agreement with you and not understanding the Italian I read subtitles so their translations also were misleading. Yes Leo, subtitles were misleading, but what do you think of the film?